There are arguably two kinds of epic story-telling. Code Geass is epic in its cast of nearly forty characters, countless political factions and worldly scope of events. Seirei no Moribito is the polar opposite: its pacing and animation budget dictate a weight overloaded with subtext and self-awareness, like the path of an iceberg. 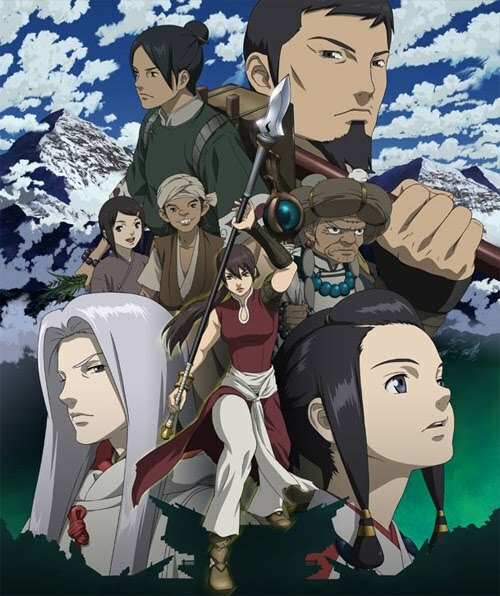 Production I.G developed this series (based on a book series of the same name and premise) and after it began airing in 2008 on Adult Swim, it was swiftly cancelled. Thankfully, Seirei returned to Adult Swim last summer for the entire series. The big guns were brought out for this one, including Kenji Kawai, whose subtle score could challenge John Williams. Kawai’s credits include the live-action Death Note movies, Ghost in the Shell, Patlabor, Gundam 00, Ranma 1/2, and The Sky Crawlers  did I mention he’s been around? The number one staff member to keep an eye on, though, is the young and ambitious Kenji Kamiyama. His most recent project, Eden of the East is...I can’t talk about that now without drooling. Let’s stick with feudal-era spear-wielders, shall we? The panoramic eye-candy, from snow-crested mountains to rural rice paddies to treacherous forests, is rewarding in itself. Even the village episodes hold such detail you almost choke on the dust rising from the streets. Every episode looks like Miyazaki could have inked it himself; that’s how high-budget this project is. The story is simple enough. Balsa, an experienced spear-wielding bodyguard, is charged to protect the second prince of a feudal empire, Chagum, who holds inside of him the egg of a water spirit that could summon either rain or drought. As Balsa hides the prince from pursuers from the palace, he is instituted in the school of simple peasant life, becoming his own man. On the way we learn the vast details of this world, a mélange of nearly every Asian culture, from ancient Chinese Dynasties to Shinto/Taoism fusion. It’s a pleasing aesthetic, achieving a sort of visual zen in background art. These details flesh out the world, its countries, landscapes and cultures with magnificent detail, giving the World of Warcraft writers a serious run for their money. Our main character, Balsa, is unlike any protagonist I’ve ever encountered. For starters, she’s in her thirties. I KNOW, RIGHT?! Second of all, she has no sword. IS THIS ANIME?! And the series goes without flashbacks until five episodes from the end. THAT’S IMPOSSIBLE! The fight scenes (all five of them) are fluid, kinetic, and framed in real-time, making them visceral, gritty and real. They are so brilliantly choreographed and stunning to watch that it’s almost a letdown when they end, like eating the cherry off the sundae before the ice cream gets to melt. Seieri’s supporting cast is diverse, though distant and dry. Shaman Torogai is old, vulgar yet wise. Her apprentice Tanda is reserved and...that’s about it. He makes herbs. The palace’s master astrologist, Shuga, spends much of the series in research, as we never quite understand every detail to the egg inside Chagum nor what to do with it. The eight assassins sent after Balsa are the most well-coordinated criminal-investigator ninja ever. (Law & Order meets Ninja Scroll). However, the mood of the series and monotonous voice directing take away a lot of the passion and interest from the characters. With twenty-six episodes to develop this year-long tale, the show spreads itself pretty thin in order to properly cultivate the world and the handful of essential characters, which can be enough for some, but a turn-off for many viewers. The pacing of Seirei no Moribito is the most prominent element of this series, and it has to be properly addressed. Sluggish at times, comatose at others, it’s hard to watch this series one episode at a time. Many chapters revolve around a single dialogue that will have little or no consequence, or if it does, the subtlety is so intense that you lose track of what you’re watching. Sometimes the pacing simply embellishes the lavish and meticulously-detailed backgrounds, which is needed in order to show off just how beautiful they are. However, there are several stretches of episodes where NOTHING happens; maybe Shuga researches or Chagum delivers a public lecture on game theory, but these episodes are a battle against your eyelids. Pacing problems set aside, this is a simple tale beautifully animated, and when it decides to be an action series, it’s on par with the fights of Cowboy Bebop and the boss fight from Grenadier. Solid story-telling with a memorable cast.